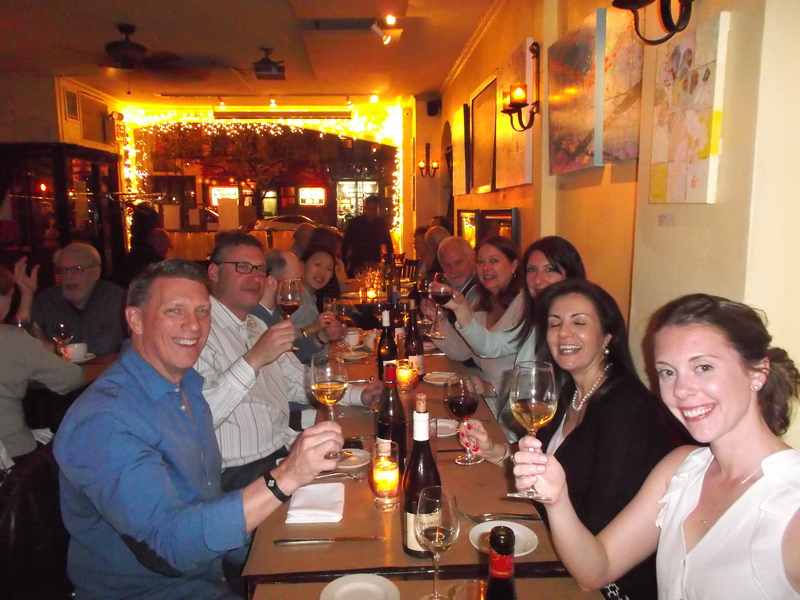 This past Saturday we co-hosted a blind wine tasting of fine wines from several fabulous regions of France. This fun event was held at the NYC home of “frequent travelers” Kat & Mark. 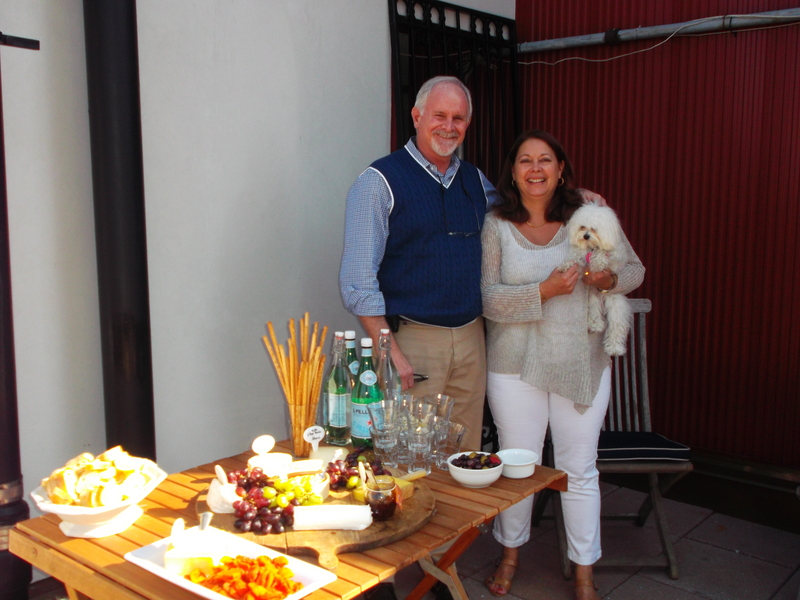 They graciously opened their lovely home on a perfect day, and stocked the tables with fabulous French and Spanish cheeses and delicious gourmet treats! Each glass had a name Just before arrival, our hosts and “penny” enjoying the sunshine. We tasted 5 wines, all from France. Wine 1: Laurent Combier Crozes Hermitage white. A beautiful wine with floral notes and a rich bouquet. This wine is from just north of Chateauneuf du Pape. People don’t think of Chateauneuf du Pape as a town or even area that produces whites, but they produce excellent white wines. This is a very small part of production but the top ones are truly special –and hard to find in the US. We regularly highlight these when in Provence. Wine 2: Meursault, Les Narvaux, 2010 David Moret. A great buttery chardonnay. Loved this wine (as I do all Burgundy wines). This wine has a bit more minerality than the Les Charmes, 1er cru, we like to profile on our Burgundy trips. Our hosts this past September in Burgundy on a private visit to the 14th Century cellars of the winemaker who owns our luxury inn! Wine 3: Auxey Duresses, 2010, Billard. A very nice pinot noir from Burgundy. However, Burgundy did not receive its due by comparing and tasting a village wine with the 1er Grand Cru classe from Bordeaux. Next tasting I will showcase wines from Burgundy that are equal in quality and ranking to the ones from Bordeaux. Because this region’s wines have such a “wow” factor -and the area itself is so stunning –it’s a shame to leave people thinking one region is superior to the other! Wine 4: Les Amouriers, Vacqueyras, 2010. This grenache and syrah wine is also from just north of Chateauneuf du Pape, and a very accessible alternative to the big names (and prices) of Chateauneuf du Pape reds. Needs to breath for about 90 minutes to 2 hours as it is young. But is a good wine, full flavored and a great example of what the region can produce. Wine 5: Chateau Pavie Macquin, 2007, her Grand Cru Classe. Predominantly merlot (84%) with 16% cabernet franc, this wine is truly a top wine. It surely overshadowed the other reds. It was smooth, rich and extremely well balanced. Still young, it was opened 2 hours before drinking. Next tasting, we will bring out the big guns in Burgundy to compare with Bordeaux. I think it will be a very tough decision for folks at that point! Thank you to all of your who came. And for those of you who couldn’t make it, we hope to be able to hold “reunions” for other groups and more return travelers! One final shot of those of us who went out for dinner at a cute French style bistro after the tasting. Hope to see you in all again very soon! Burgundy, Chateauneuf du Pape, Bordeaux… people “oooh and ahh” over these fabulous wines –forgetting that they are place names –names of villages and towns, not actually names of specific “brands” or even “makers” of wines. Certainly the places have a terroir that creates a similarity between the wines and the foods. So too, certain grapes (which have different flavors) are grown in certain regions (like pinot noir in Burgundy or Grenache in Chateauneuf du Pape) and that also gives wines from a particular area similar flavor profiles. It’s a good idea to find what grapes you like, first. In some ways saying “I like Chateauneuf du Pape” is like saying “I like Princeton food” or “I like bread from New York City” –okay….but which food in Princeton? What restaurant? Which bread? They are, within a common American theme, all very different…just like the wines made by different people of the same region or village in France. One exception to this idea is where the place uses only one grape. The best example of this is Burgundy. By using one grape –the wines are much more identifiable by area. A French pinot tastes completely different than an American one. Then there are cheeses. Also similar to wines in that their place names have almost become their brand names to us. Why do I say that? Well, Camembert is from ….you guessed it! And Roquefort? That’s right. Towns name their prized products (much like people do) after themselves! Now, it might make sense to you why “Champagne” would be so upset that people from other places started calling their sparkling wines by their regions proper name. They thought it was deceptive. Many of us would agree if we were to see a company called, for example, Beverly Hills Real Estate Brokers located in Brooklyn. Same concept. So, what did we pair at our Tour de France of wine and cheese. Here’s the list. Below are the tasting notes. 1. Champagne Marie Weiss, paired with a Brie. (And a Cremant d’Alsace as the bargain substitute for this pairing). It’s blend of 25% Pinot Noir, 25% Pinot Meunier and 50% Chardonnay from the Montagne de Reims and the Cote des Blancs. About half of the juice comes from 1er Cru and Grand Cru vineyards. The Marie Weiss label is produced by the superb, small Champagne house of Ployez-Jacquemart, near Reims. The nose is of apple, white peach, brioche, and fresh nutmeg. It is full-bodied, crisp and balanced. 2. Laurent Combier Crozes Hermitage Blanc with Chevre and fig jam. Both from Provence, where figs also grow –this is combination that really enhances the flavors of each. The wine is made up of 80% Marsanne and 20% Roussanne, is aged in temperature controlled stainless steel, and 30% is fermented and aged in new oak. Aromatic nose combines flowers, dried fruits. Medium body, perfect acidity. Ready to drink right away. 3. David Moret, Bourgogne, 2010 paired with Epoisses. Epoisse, a cow’s milk, bloomy rind cheese from Burgundy, that is washed in a Marc de Bourgogne is a wonderful treat. This was a great chardonnay made in the town of Beaune. 4. Bourgogne Pinot Noir with a crystalized, well aged Comte. Unless you’ve tasted a real, well aged Comte –you won’t understand the allure of this pairing. We compared this with a California pinot noir to highlight the fruit forward flavor of the California pinots and to explain the common characteristics of the French Burgundy wines. There is a video linked to this photo so that you can see a wine trip to Burgundy. You can also access the video on the Bliss Travels website. 5. Vacqueyras (Les Amouriers) primarily grenache –with small percentages of Carignan, Merlot, Syrah, Grenache blanc, Roussanne, Viognier. This was served with a St Marcellin. The wine was put in a carafe 1h 30m before drinking to allow it to aerate so that the tannins would soften. There was spice and fullness to this wine. This was best liked by the group as a whole. 6. Muscat de Beaume de Venise with Forme d’Ambert -sweet and strong. A great finish to a meal. A muscat is a fortified sweet wine from a stunning postage stamp sized Provencal village like the one below. 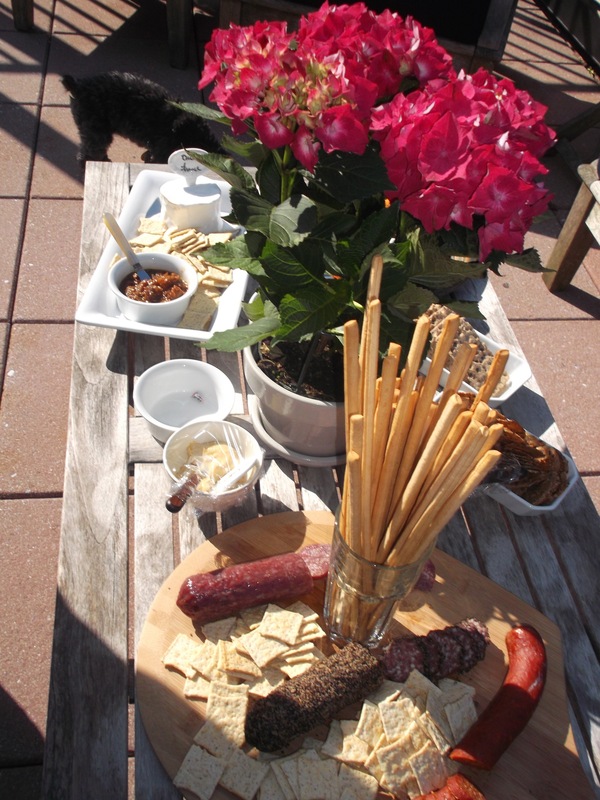 It is offered typically as an apero and served with olives or other salty contrast. Serve more chilled than typical whites. Is ready to drink right away. So, other than following the list (mine or anyone else’s) how do you find a way to pair wine and cheese yourself? Well, you’ve probably figured out that cheese that is made from animals who graze on the same land as the land where the grapes that make your wine have grown, fit the wine very well together. An herbed rack of lamb is lovely with a Rhone wine because the land infuses both with the same subtle flavors and spice. So, if you’re looking for an “easy fix” find the cheese that is from the same area as the wine. This dish paired beautifully with a Chateauneuf du Pape, La Nerthe (white)….So well, we did it twice! A big thank you to Swati and Vinnay who generously purchased the wine and cheese “tour” to benefit the Pennington School! Thank you for being wonderful hosts and inviting a great group of people! Any questions? Contact Wendy et a tres bientot a tous! On our recent trip to Provence we visited the Luberon and Chateauneuf du Pape. and, mais oui, dining -in this case, on the season’s first truffles. Truffles in a creamy polenta. One of the highlights is always the Provencal scenery. The ruins of Chateauneuf du Pape compete for our attention with the changing colored vines, and the gorgeous Medieval villages… Hard to choose which is the best view. This particular trip included some light hikes through the countryside as well as the ocher mines, sightseeing in various Medieval villages, and a day trip to Chateauneuf du Pape for some truly remarkable wines from some pretty great vintages (Beaucastel, La Nerthe, Vieux Telegraphe, Barroche…to name a few). Click on the “wine” and watch the video Anthony Bianciella made of our trip so that you can take a “virtual vacation” in Provence. Our next trip to Provence with Anthony is this May….Everything will be in bloom. Poppies, iris’s, cherry blossoms. It is a gorgeous time of year to go to Provence. Some of Anthony’s Spring photos are below. Click on any of the photos to learn more about our May 2013 trip to Provence. It’s small, custom and pure Bliss! flower boxes around every corner. spring produce fills the markets. Summer is in full swing and we have some exciting photographs to share. Don’t miss our October trip to Paris and Provence, where we will highlight Chateauneuf du Pape, fall foliage and the beautiful Luberon region of Provence. Photographer Anthony Bianciella will once again partner with us on our exciting adventure. Off the beaten track, insider experiences…And the chance to preserve those memories with spectacular photographs. – like wine and cheese but lasts longer! Provence (Chateauneuf du Pape) & Paris! Our October trip is designed for those who like to learn a little while they enjoy the finer things in life. All along the journey, we will provide information about the region, details about French wines and French cuisine and even help you take great photos of the experience so you can bring your memories home with you. Just sit back and enjoy the ride. We’ll help you navigate the beautiful landscape and ensure that you will see and experience things that only an insider could see and do. For more information and a full itinerary, please visit our website at Bliss Travels (www.blisstravels.com). ” We really had a great trip, you made it all come together so nicely, picked a perfect hotel and a fantastic mix of restaurants. You made all of the planning so easy and stress free. The tours of the sites, gardens and museums was perfect … we feel that we really got to “know” Paris in just a few days. per room on either Christmas Week in Paris or May trip to Provence if you book before September 1, 2012. Contact wendy@blisstravels. and put “$200, Early Booking” in your subject line. One of our favorite days…A lunch in a small village, following a private wine tasting, in a cave from the 1400’s. The meal is custom to the group and the company is amazing. It’s Bliss. The amazing photos were taken by Anthony Bianciella (he co leads our photography trips and chronicles our adventures). Our group of 8 was welcomed to a candle lit room with music playing. We had 4 wines from the Cote du Rhone. This tasting focuses on Chateauneuf du Pape. Some focus on Provencal Roses. We design each one for the people who are attending. A special meal was prepared for everyone. 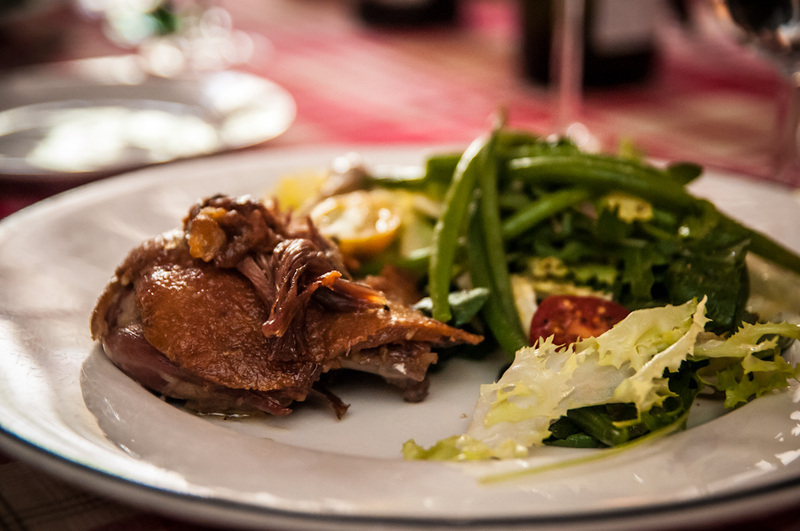 Some had a duck confit. Some had orange and fennel salad with a fish wrapped in parchment. Our fabulous host came to see us off! 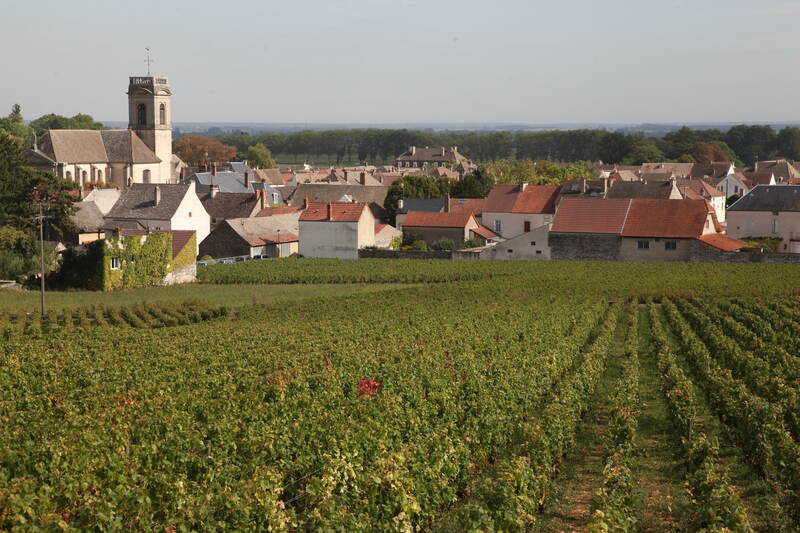 Our current Grand Cru wine trip for September 2012 (on Lot18) has all but one room sold out. I expect that one will sell in a matter of days. Travel off the beaten track and see the real Provence. Experience things most tourists don’t have access to. The trip is led by the owner of Bliss Travels, who has 30 years experience in France, and the itinerary includes a personal pre trip consultation to customize the trips meals and daily activities to cater to the preferences of the travelers. a private wine event and tasting of the best Cote du Rhones out there –which you get to help choose! All in the 1400 century cave/cellar, accompanied by a special meal prepared by the chef/owner. This addition also includes all hotels, all sightseeing, all custom events, and everything in our regular October in Provence trip!